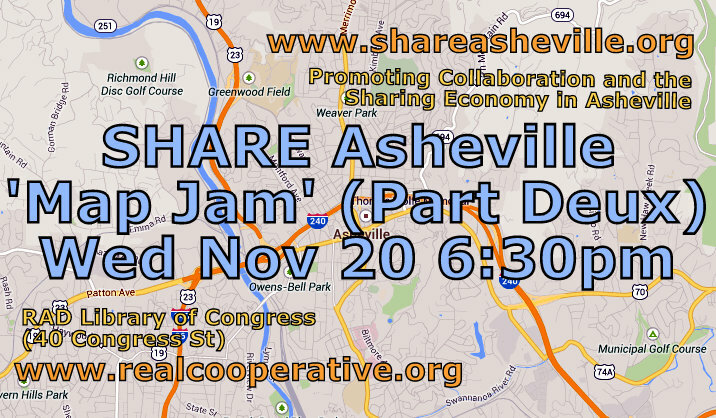 On Wednesday November 20th, community members and resiliency organizers in Asheville, NC will join together for Part 2 of the creation of a Map of what our city already has to offer from the Sharing/Collaboration/Commons perspective. The intention will be to leave the evening with a completed (digital) map that can be accessed by all residents and those passing through who wish to support a local solidarity economy. We will be adding additions to our list, recording all the necessary information about each location and making the map! Please bring a laptop or tablet if you can. Don’t worry if you can’t, we’ll have some extras on hand and will be breaking up into groups so not everyone needs to have one. Please bring something to share for the pot luck and a list of organizations, businesses, resources and events that should go on our new map of Asheville. P.S. If you can’t make it please include your ideas on the event page. Quick Note: At the first event we did a Brainstorm by sector and created a list of over 100 things to go on the MAP! We also received some media attention from the Mountain Express: How well does Asheville share?